During the nice presentations at the recent OpenTox Workshop, I noted that My OpenTox Workshop contribution: Linking explicit and implicit knowledge was lacking two slides. The slides should have had screenshot of the excellent Bioclipse applications Ola Spjuth has written in the area of computational toxicology. But here they are. 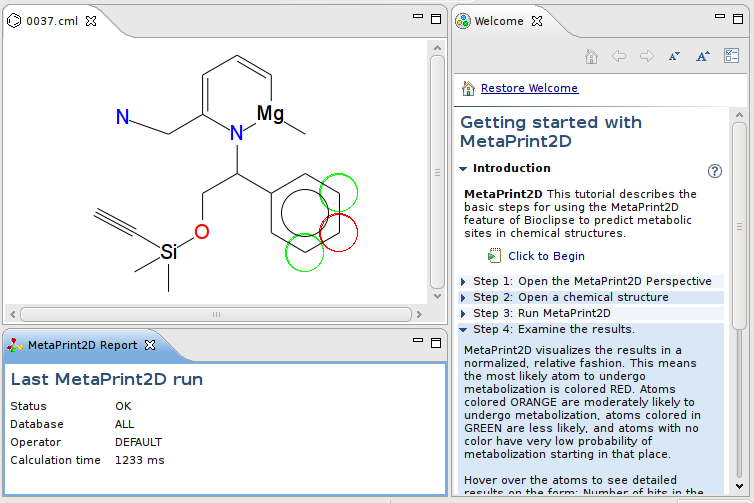 The metabolic fate of molecules can be predicted with the MetaPrint2D feature (see also the main MetaPrint2D page). The feature currently uses one specific method, but the immediate feedback you get while drawing molecules, can basically use any model. The currently used model is developed in a collaboration of Ola with Sam Adams (whom we all know for his JNI-InChI library) at Cambridge University and Lars Carlsson at Astra-Zeneca. 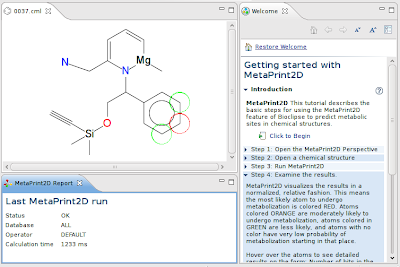 This screenshots shows the visual feedback in the (new) JChemPaint editor in Bioclipse, and on the right we see one interesting Bioclipse feature in action: the cheat sheets. These cheat sheets are inline help documentation which guides the reader through the functionality. But, unlike mere help, cheat sheets can be very interactive and perform some tasks itself, making it easier for the reader to see what was supposed to happen. L. Carlsson, O. Spjuth, S.E. Adams, R.C. Glen, S. Boyer, Use of Historic Metabolic Biotransformation Data as a Means of Anticipating Metabolic Sites Using MetaPrint2D and Bioclipse, accepted in BMC Bioinformatics. Structural alerts are one method to signal the scientist that the molecule under study needs some more attention (see for example doi:10.1016/j.mrrev.2008.05.003). It helps him decide to continue to look at that particular structure, or to move on. 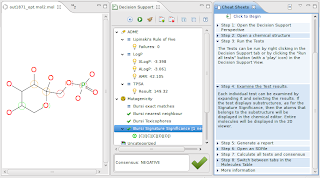 Ola also developed a decision support plugin. One of the cool features is that, in good Bioclipse habits, deliver a pluggable architecture. This practically means, that anyone can add their own decision rules; those can be added as local software, or as services on a central, institute specific server. 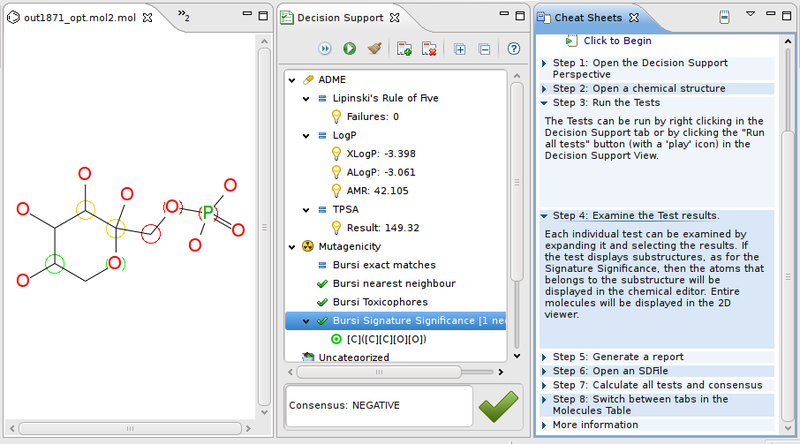 The results in this screenshot show that a Bursi AMES data-based model estimates that this molecule is mutagenetic. @Vladimir, good question. The problem here is really lack of Open Data. The MetaPrint2D uses, if I understood Ola correctly and nothing has changed since, a model, and not the data from which it was derived. That is, the model does not contain the metabolic reactions, but a derived representation. Sort of a fingerprint, really. The paper will explain the used fingerprint. The point is, however, that the available information cannot predict the actual reaction. The original data is hidden in a proprietary databases, and unfortunately, not available. I understand the problem of the data avaliability: several xenobiotic metabolite databases exist but they all are really messed-up. But first we predict all kinds of metabolites (most of the books have many xenobiotic transformations), second - we prioritize them. Ah, you are using Sam's webpage. I had not seen the MetaPrint2D-REACT bits yet! Nice indeed!